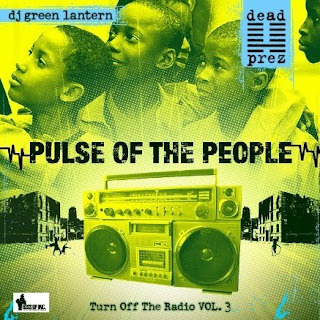 Dead Prez/RC Williams & The Gritz Band/Jay Clipp (Prophet Bar): Dead Prez seems to have at mellowed out considerably, at least in sound, if not in world view, judging by what I've heard on their most recent album, Pulse Of The People. Their newest music is no longer the harsh, minimal sound that they made their name on, and instead tracks are fleshed out with bigger production, lush instrumentation, and melodic backing vocals. Their lyrical content is still socially conscious and aggravated, but stic.man and M-1 seem less interested in making the music as confrontational as the message at this point, which is bound to happen with any group that has been as intense as they have for as long as they have. Most of the record isn't as light as this track, entitled "Summertime," but it's a good example of how startlingly calm some of their more recent work can be. In any event, I would definitely take the opportunity to catch this show if you can, as it's not often that a hip hop act this highly regarded plays such a small venue in Dallas on a Wednesday night. I did a double take when I first saw the advertisement. Decades With DJ Nodad (Rubber Gloves): DJ Nodad will be giving away free copies of Denton Deluxe Volume 5, ahead of its official release this weekend. The new edition will be available at Time Bandits on Saturday if you miss out tonight. Remember that Time Bandits has moved to 308 E. Oak St., just off the square in Denton. Doug Burr/Eleisha Eagle/Glen Farris/Kirby Brown (City Tavern): One of the most widely misspelled bills I've seen in a long time. Come on, everyone, is it that hard to double-check a name or the artist's website? The Smothers Brothers (Nokia): No clue on what attending this would actually be like, but I've always thought that the straight guy bit by Tom Smothers on this clip was great. KMFDM/Angelspit/Ugly Mustard (Granada): Show me the aging goth that attends this show, and I will show you a guy who mumbles "I work 'in computers'," when asked what he does for a living. Bad Sports/Spooky Folk/Redsean/Art By Andrew Williams (The Cavern): Bad Sports really does seem to own Dallas lately.